It’s safe to say that the fashion-centric New York digital artist couple, Pamela Reed and Matthew Rader are an obsessed duo. Whether it’s their four cats and hundreds of stuffed plush animals that share their epic, veggie cultivated rooftop garden in Brooklyn. Or Rader’s intense, hand painted Warhammer figurine collection. Reed + Rader go in. And their passion for creating new realities is a GIFtastic collision of the tangible and the digital. An augmented world where fashion editorials exist solely on the internet and their fantastical photo animations that have been created for Dazed, Another and POP saddle up alongside interactive video art that celebrates their love of pizza. 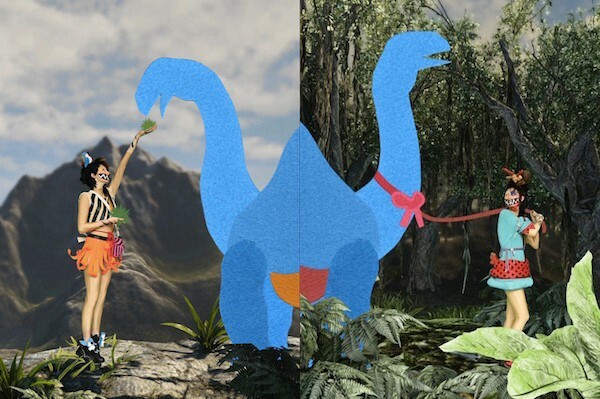 In their debut London exhibition opening tomorrow at 18 Hewett Street, Reed + Rader welcome you with open arms to their surreal world where curiosity trumps cynicism and future-jurassic, stylish pixies dance with dubstepping dinosaurs. A tropical jungle and land before time that trades on fun, optimism and pizza through video, GIFs and sculptures. Ahead of Reed + Rader’s Cretaceous Returns gallery show that also coincides with their 10th anniversary as collaborative artists, and the start of Internet Week Europe, the cosmic dreamers run through their most influential online destinations. I Hate Kitties is a film we made that shows a girl in a video game-like scenario defeating cats. The silly thing is, we are obsessed with cats and love our four dearly. Love to Essy Francis, Xanadu Pluto, FiFi Bofinkles and Brother Bear. Squiddies is a recent interactive project that we finished. We are really excited to start to do interactive work online because the viewer can start to participate instead of just being a passive spectator. This project was a combination of a lot of new angles we are exploring with our work. Besides the interactivity component we did 3D scans of model's heads for this. Mister Wubba is a wonderful man that we love. He's a colorful plush bird that comes from our childhood who inspires us. This website is devoted to all the friends that Mister Wubba meets in his journeys. Sticker is a website created by our friends where you can share short videos to build a conversation. Space is awesome. Mars is awesome. We love when inanimate objects are personified and have Twitter accounts. We adore this video so much that we ripped it from YouTube and backed it up in multiple lockboxes so that we have it forever. We enjoy Pokemon a lot and these two guys reminded us of ourselves.